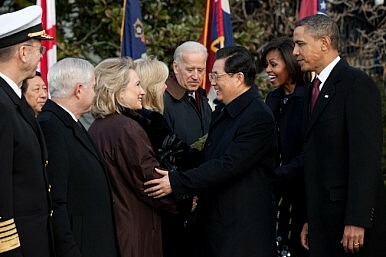 Despite a series of diplomatic challenges, relations between the U.S. and China have remained productive. Personal diplomacy is paying dividends. Since February, there have been repeated incidents in U.S.-China relations that could have produced significant strains and disruptions between Beijing and Washington. Nonetheless, relations so far have remained productive and durable. This is likely a product of the Obama administration’s top-level initiative since 2010 to draw China’s leaders into personal engagement in managing affairs to avoid or deal with tensions. The latest test was the bizarre and heroic episode last week of the “barefoot” blind lawyer and human rights protestor Chen Guangcheng finding his way out of extra-legal confinement and being spirited into the U.S. embassy in Beijing. Despite what must have been serious differences between China’s security forces and foreign policy officials over how to treat him and the Americans, Chen has so far been able to continue planning to take his family to the United States to study law in the next few weeks. When the former police chief of Chongqing visited the U.S. consulate in Chengdu in February, he revealed innermost secrets of crimes and corruption by family and associates of a potential top leader, Bo Xilai, the party secretary of Chongqing. Reports are rife but unconfirmed that the chief of the security forces in China, Zhou Yongkang, has since suffered lost influence due to his relationship with Bo. Yet there’s an absence of signs that the security forces are seeking to retaliate by making a case that the United States needs to be taught a lesson about its diplomatic interference in China’s internal affairs. Two weeks ago, in a letter to Congress intended to unblock the nomination of new Assistant Secretary of Defense for Asian and Pacific Security Affairs Mark Lippert, the White House promised to consider, but not necessarily sell, new military aircraft to Taiwan. This is a perennially neuralgic issue for Beijing, yet it seems so far to have brushed the letter off more as internal maneuvering over personnel than a real sign of an impending arms sale, which is an accurate assessment. Quite impressively, China swallowed all these events and proceeded to host a comparatively productive and smooth Strategic and Economic Dialogue (S&ED) last week. Though most observers wouldn’t have noticed the conclave, given the excited reporting about Chen Guangcheng that dominated the news, it produced modest breakthroughs on financial services investment, the currency regime, and expanded high technology exports. The companion Strategic Security Dialogue between the two militaries also met smoothly and at greater length than previously. These outcomes are respectable in what is a sensitive political year in both countries. Further, Chinese Defense Minister Liang Guanglie traveled to the United States in the immediate aftermath of the media turmoil last week for the first visit at his level in nine years, a gap produced by successive spats that made the People’s Liberation Army reluctant to meet. At neither of these two recent military meetings did China raise the Taiwan arms letter, when its officers could easily have done so in the context of other discussion about continued U.S. sales to Taiwan.